Matei Serban Sandu - Exhibition "Circus Is Coming to Town" opens Tuesday, December 10, 2013,19:00, at the headquarters of the National Library and it will be on display until January 10 2014. Exhibition is organized by the Cultural Association "Societatea de Maine" and ArtXpert Gallery, and brings together six large works on canvas (200cm x 180cm), two wooden panels (40cm x 165 cm) presenting the constant work of the artist in the last year. Matei uses humanity as his symbols. More specifically he uses the flawed, troubled, rejected or simply average parts of humanity, to communicate his social messages. His paintings examine our daily struggle walking the line between right and wrong, strength and weakness, and generally dealing the daily ‘circus’ of our society’s characters, especially those in positions of power. Or perhaps we are the circus performers in a society in which the ruling elite benefit from our work and the only chance we have of improving our status is to make it to center ring of the three ring circus. 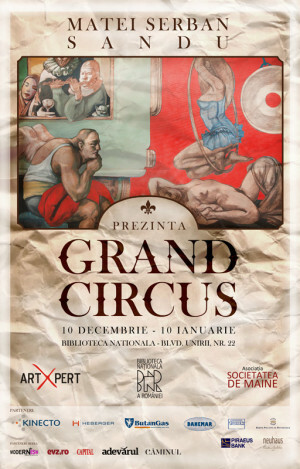 "Circus Is Coming to Town @ National Library" Art Show in Bucharest. You can get here description, reviews, address, time and details of "Circus Is Coming to Town @ National Library" Art Show in Bucharest. Visit Bucharest Tips for more Art Show events in Bucharest!